There is one aspect of a healthy balanced mind that I am enjoying in particular in the years since overcoming the dysfunctional thinking that was a huge part of my depression. I find it much easier to accept unexpected changes to plans. I think my old pattern of rigidity was an attempt to protect myself from any possible discomfort I might experience over not being adequately prepared for some new scenario that might pop up. My new perspective resulted from an exercise of examining what the worst possible outcomes might be for situations that I was earnestly wanting to avoid. In the end, there was never anything that deserved the level of angst I was nurturing. Cyndie and I had big plans for this coming weekend. It has morphed a little to become “not as big” plans now. We are going on a little “stay-cation” to her parent’s house in Edina, leaving Jackie to take her first shift of managing the ranch for an extended few days. I had intended to pack enough things last night to allow me to leave from work today and go straight to the Edina house for the entire time. Then on Monday morning, I’d only need to drive the short distance again to work. Now both ends of the plan have shifted. Cyndie was assigned a responsibility to manage affairs for an aunt who is moving from her own home into a nursing care facility. This event is claiming her full attention this week and she just isn’t ready to be away as early as we originally envisioned. That actually eased my burden of trying to pack the bike in the car before work today, because I am going to want it with me over the weekend to continue my conditioning efforts before the Tour of Minnesota begins in another week. 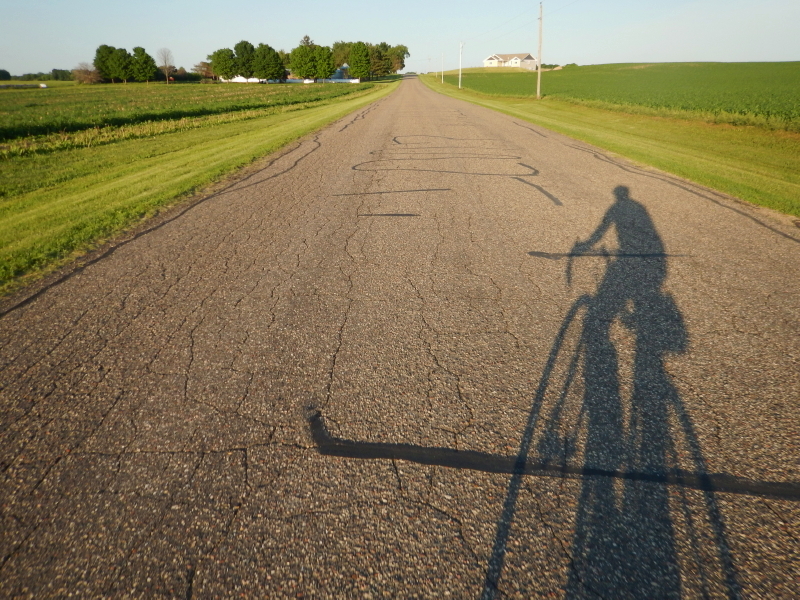 In fact, the night off allowed me a chance to get out and ride for an hour last night. That was a particularly pleasant outing due to perfect weather conditions. Now we are thinking we’ll pack up and head for Edina tomorrow morning. The back end of the plan for the upcoming weekend has also changed for me. As the date closed in, I realized I have an appointment to drop off my car at the body shop to repair my deer-dented doors and pick up a rental car. I’ll head home Sunday night to fit in that detail. Other than those two changes, the middle of the extended weekend plans are still standing firm. For now. What’s the worst that could happen if those end up changing, too? Nothing that we won’t be able to adjust to, …kind of like the way horses get back to grazing so quickly after something rattles their calm. Here’s to mastering the art of being comfortable with the possibility that plans might change. If you want to take it up a level, the next step is mastering the art of visualizing the best possible outcomes, and allowing it to become your ongoing default perspective. Then you get to celebrate with reckless abandon when something changes, and the outcome ends up even better than the best possibility you imagined!